What a Sensational View of The Gulf of Mexico From This 5th Floor Unit at Sunset Vistas Beachfront Suites. It Is One Of The Newer Complexes That Has All Of The Amenities Of A Hotel Yet A Spacious Condo. This Two Bedroom, Two Bathroom Condo is Situated in One of The Most Desired Resorts in Treasure Island. The Condo/Hotel offers Granite Counter Tops, New Appliances, King bed in the master, Queen Bed in the second bedroom and a Sleep Sofa. Awarded The Trip Advisor Certificate of Excellence. Freshly Decorated With Coastal Living Style Furniture. The Balcony Extends in Front of Living Room and Master Bedroom Overlooking the Gulf With Access From Both. The view is spectacular! Master Bedroom Has Its Own Private Bath. All The Amenities Of Home, With Sunsets That will Take Your Breath Away. You Can Satisfy Your Hunger at The Café or Have a Tropical Cocktail at The Beach Bar. Cool off in our geo thermally heated swimming pool (with a separate children’s pool). Enjoy The whirlpool spa, revitalize in the spacious fitness center or refresh yourself by the fountains in the tropical courtyard. Explore some of the world’s finest beaches, parasail, jet ski or visit nearby John’s Pass for Fishing and Shopping which is a short walk North. It's all here. Relax and Enjoy! My husband and I are native to Buffalo New York. The cold winters in Buffalo are what brought us to vacation throughout Florida when our children were younger. We liked the laid back family atmosphere of the Treasure Island area and specifically Sunset Vistas. My husband also enjoys fishing and it is world class in this area. Being able to navigate the beaches with ease was a plus for us. There are times we only use our car for groceries. Being small business owners it is difficult to get away for long periods of time and being in the Sunset Vistas rental program was a plus for us. Customer service is very important to us as vacationers and we wanted the same great service for our guests. No punching in a code to get into the condo or having to call an answering service if you need assistance. That's what are staff are for. We love the feeling of being at a hotel with all the amenities, yet, inside you have all of the conveniences of home. For us, it is the best of both worlds. The hotel atmosphere with the convenience and space of a condo and the ability to have breakfast and lunch "in" was an added plus. We have found this a big time and cost savings. Having access to the staff at the property is what we like the best. It gives you a sense of security knowing that as a vacationer your personal contact with me is not over once the reservation is made. Our staff are there for you 24/7. They are a great group of people that will do everything they can to make your stay more pleasurable. Our location is within 20 minutes to downtown St. Pete, 20 minutes to Clearwater, 30 minutes to Tampa International Airport, 10 minute walk to Johns Pass, a 1 hour boat trip to the best fishing anyone could ask for and of course a 2 minute walk to the warm waters of the Gulf of Mexico!! complimentary trash and towel change after every 2 night. Courtesy book nook in Cafe. Geothermally heated to 82 degrees regardless of outdoor temperature. Also the splash pad is located on the opposite side of the building. Overall very happy with the condo. So good to hear this! I hope to have you back again when you need a little R&R on the beach! Keep my number handy. Clean,comfortable, well managed and fun! Condo location is a short walk to everything. Inexpensive trolly service handles most other transportation needs. Condo resort is VERY well managed and generous to guests needs Beds were very comfortable, and overall condo was quiet There was some noise from the condo above. Furniture scooting, little kids running around. No voices. Kitchen was pretty well equipped for cooking meals though very basic and low end. Furniture in our condo was a bit worn but not uncomfortable. table for beverage. Guests are allowed to smoke on the balcony so be prepared to smell it. We also wish there were gas grills outdoors. They do have small, park like grills on the grounds. Overall, excellent. We stayed two months and our needs might be greater than those having a shorter stay. I am so pleased that you enjoyed your stay and am happy that you are returning to the area next year. I am concerned that you thought the furniture looked a bit "worn". Our management company is usually very proactive in replacing furniture for us owners before needed, so I will be happy to have them reevaluate it immediately. Thank you for taking the time to write a review as we take them very seriously. Have a safe trip home! can't be beat. We beached all day and walked to John's Pass for shopping and dinner. We'd definitely go back! Sounds like you did exactly what we like to do. "Work" hard all day on the beach and play at night. Johns Pass has some really interesting stores. Definitely something for everyone. We especially like to sit on the boardwalk near sunset and watch the dolphins play in the channel. I agree with the on site staff. They are the best and I will be sure to send a message to management to have them pass along the compliment! Exactly as described. Our family loved it. The beach was just perfect . Lots to do in the area and the condo was a perfect set up for us. We had everything we needed. 2nd stay at this resort and will be returning again soon! I could not ask for a better review. Its always a pleasure to have you back! It was pretty magical. Nice view of the sunset over the gulf from the balcony. We watched a wedding taking place on the beach from the balcony one afternoon. The place was nice and clean, and the owner provided great communication. A+!!! Thank you for taking the time to write a review. It is very helpful not only to myself but to future guests. Our section of the beach and complex is very popular for weddings. Makes for an exciting " beach watch" waiting for the bridal party. I am happy that you caught one of the amazing sunsets and hope to have you back again in the future. Sunset Vistas is easily accessible to the many attractions along the west coast of Florida. Locally, Treasure Island is home to John's Pass Fishing and Shopping Village, and one of Florida's finest white sandy beaches. Dinner and casino cruises are only steps away as are adventure tours, including parasailing, scuba diving and jet skiing. In nearby St. Petersburg you can enjoy fascinating museums, The Pier, and Fort De Soto Beach (recently rated the top beach in the United States). Tarpon Springs is a quaint Greek fishing village known for sponge diving. In Tampa you will want to visit historic Ybor City, the Florida Aquarium, Lowry Park Zoo, MOSI (Museum of Science and Industry) and of course Busch Gardens and Adventure Island. Make Sunset Vistas your home to experience Tampa Bay Devil Rays baseball, Buccaneer NFL football or Lightning NHL hockey. 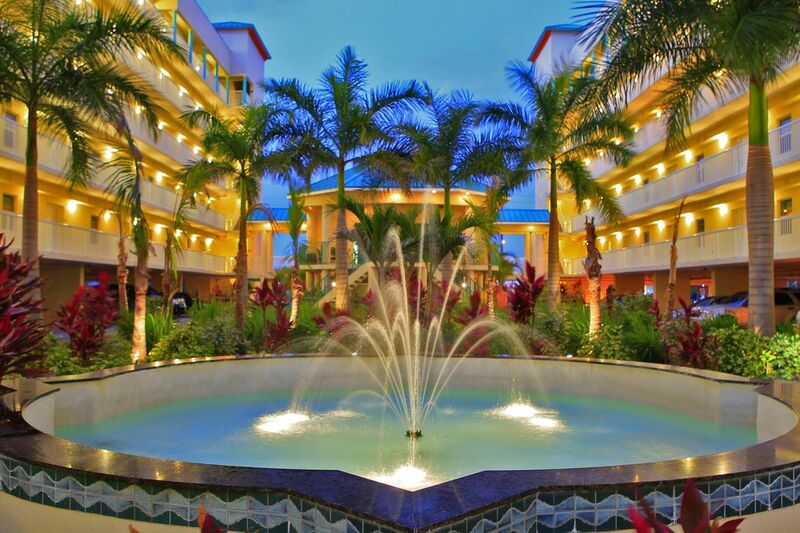 Our staff will be delighted to help steer you in the direction of your most memorable vacation experience! Minimum stays requires during Holidays. Rates slightly higher during holidays and special events. Sat-Sat rental only in Feb- Apr.